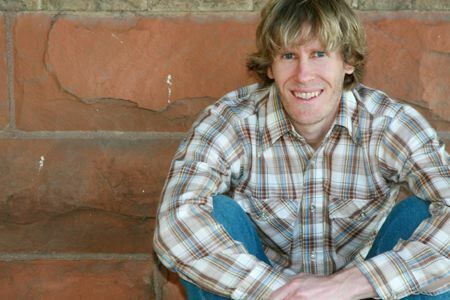 April 17, 2009 | USU alumnus Adam Ward has recently relinquished his membership in the Mormon Tabernacle Choir and begun a pioneer quest of individual creative expression with the release of his first solo album. After touring and recording with the world-famous religious choir for over three years, Ward has taken the first steps of his personal crusade as a solo artist with the release of "The Door." The self-described folk artist is unrepentant and feels no remorse for leaving the choir, but felt it was a necessity for him to free up the time to focus on his own music. Ward, 36, is married and serves as vice-president of a software company. He decided in 2008 that it was time for him to leave the choir and seek new experiences. "I have a different mentality. I am more of the type of person who likes to experience lots of different things," Ward said, "In order to experience something new you have to give up something you are doing." Ward said becoming a member of the choir was never really a life-long dream or aspiration for him, but that he tried out for the choral group at the suggestion by his Uncle, who was in the choir for approximately 20 years. Ward, a Hyrum native and current resident of Centerville, said he had grown up watching for his uncle's face when the choir preformed, but had never yearned to join like many vocalists familiar with the choir are prone to do. Ward said he was amazed at how frequently people would envy him when he told them he was in the choir, confessing it was one of their life-long dreams. Ward said he will never regret leaving the choir, and compared his departure to the time he sold a 1968 Ford Mustang he use to own. "I am not going to feel bad about not having that experience anymore," Ward said. "I have taken that approach with everything in life. I wasn't going to be one of those guys who wishes he hadn't sold an old car." Ward, however, did say he was prone to feeling a tinge of nostalgia while watching the choir when he sees where he used to stand and recognizes friendly faces. All of the 16 songs on "The Door" are arranged and preformed by Ward, who not only displays his vocal and composing talent, but his ability to play the piano, slide guitar, and accordion. Ward, who graduated from Utah State in 1996 with a Bachelor of Arts in Print Journalism, has always had a knack for creating music. He said he was introduced to the piano early in life by his mother who taught piano lessons for 35 years. It was only a few years after starting lessons from someone else at the age of 5 that Ward began writing his own songs. Ward's music has been described as "Utah-centric," and Ward said his high tenor voice is often confused or compared with a romantic low female voice. "No guy wants to hear that his voice is being compared to a woman," Ward said, "but that is my voice, and I'm going to sing in the range of my voice. I write the songs specifically for my voice." Utah State University's Music Department Head and former director of the Tabernacle Choir, Craig Jessop, was quoted as describing Ward's voice as creative, new, and original. "Any musician wants to be unique, or what is the point?" Ward said. "I don't know if my sound is unique, but my approach is." Ward describes his music as jazz-infused folk, and said that he likes to have a good story behind each song he writes. This "unique approach" is evident throughout Ward's album, and perhaps best illustrated by the song appropriately entitled "Backhoe man." Ward said he drew from personal experience when writing the song. It is a perfect combination of his mother, who graduated with a performance degree, and his father, who purchased a backhoe in 1978. "This is what you get if Chopin had been a heavy equipment operator," Ward said, "No one in his right mind is going to write a song about a backhoe man." The lack of boundaries and restriction to a specific genre are the reasons Ward gave for his idiosyncratic style. Ward said he isn't with a label or creating his songs and making an album for a particular market, but rather "as a release for my creative juices." He said he is continually writing and thinking of new songs. "I always have an idea swirling around in my brain," Ward said, ""when music or a melody comes, I have to develop it. The song I am most excited about at any given time is the one I am thinking about." Ward said he plans on continuing to make albums, but doesn't have enough time to constantly be working at it. "You always have more things you would like to do then you can do," Ward said. "Life is a balance. You have to prioritize." He said the best way to accomplish your plans is to set a goal and consistently work at it even if it is only a little bit at a time. Ward said the oldest song on his album was written in 1995. Part of the inspiration to make the album, Ward said, came from performing shows in his home and throughout Davis county. "I do enjoy performing and would love to do more of that," Ward said, "I first started playing these songs at house parties, and would get positive feedback. The more positive feedback I got, the more confident I became." Ward said most of his songs are performance based, and require the right type of setting. Ward said it has been more than 12 years since he lived in Cache Valley, but would love to come back and preform. "Now that the album is done, I would love to perform at the new concert hall," Ward said. "The Door" is available on iTunes and CD Baby. To find out more about Adam Ward and his music you can visit http://adamward.us/.